Matt Kenseth blew past car after car that were slowing from empty fuel cells on the final lap of Sunday’s Sprint Cup Series race at Pocono Raceway and went on to win his second race of the season. The victory was Kenseth’s second of the season, first at Pocono and allowed him to clinch a berth in the 10-race, 16-driver Chase playoffs. “Glad to get one here at Pocono,” Kenseth, who also was in fuel trouble in the late going, said. 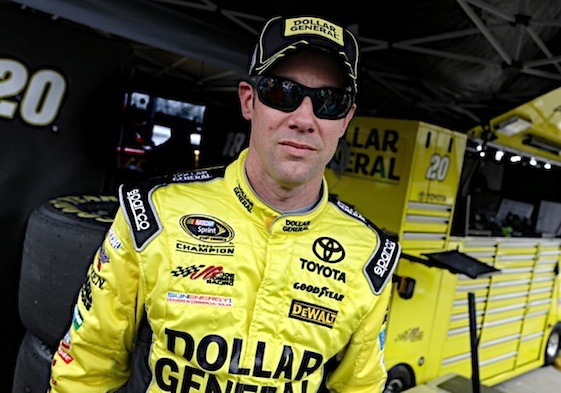 One of the fuel-starved cars which Kenseth passed on the final lap was that of Joe Gibbs Racing teammate Kyle Busch, who was going for his fourth straight victory. NASCAR mandated he do to make the Chase in light of missing the first 11 races of the season with broken bones in his legs. Busch will head to next weekend’s race at the Watkins Glen road course 13 points out of 30th place and with five races no remain until the start of the Chase. Joey Logano had the lead ahead of Busch but with three laps to go, he ran out of fuel at the 2.5-mile Pocono triangle. Also running out of fuel was front runner Martin Truex Jr. at the end of the race. While Kenseth was able save fuel, he said it wasn’t easy. Finishing second was Team Penske’s Brad Keselowski. Jeff Gordon finished third. It was a welcome result for the four-time champion who is retiring from full-time driving at the end of the season and who has struggled in 2015. Right behind Gordon was Hendrick Motorsports teammate Dale Earnhardt Jr., who survived a late speeding penalty to get his fourth-place finish. It wasn’t just fuel shortages that sidelined top drivers Sunday. Kevin Harvick took a small hit in the point standings when he left the race early with a blown engine on Lap 20. Also out early was Kasey Kahne. His exit was forced by a scary wreck in which his car Clipped the outside wall in Turn 3 and shot across the track into pit lane. His Hendrick Motorsports Chevy ended up ramming the pit wall. The wall was severely damaged and a red flag was called as crews fixed the wall. (7) Matt Kenseth, Toyota, 160, $233601. (9) Brad Keselowski, Ford, 160, $205166. (10) Jeff Gordon, Chevrolet, 160, $181686. (15) Dale Earnhardt Jr., Chevrolet, 160, $134375. (25) Greg Biffle, Ford, 160, $139908. (12) Jimmie Johnson, Chevrolet, 160, $144851. (22) AJ Allmendinger, Chevrolet, 160, $125323. (19) Clint Bowyer, Toyota, 160, $124073. (5) Tony Stewart, Chevrolet, 160, $116279. (8) Carl Edwards, Toyota, 160, $87915. (18) Paul Menard, Chevrolet, 160, $94440. (27) Kyle Larson, Chevrolet, 160, $112908. (4) Austin Dillon, Chevrolet, 160, $120611. (29) Landon Cassill(i), Chevrolet, 160, $82250. (17) Jamie McMurray, Chevrolet, 160, $111541. (20) Danica Patrick, Chevrolet, 160, $89125. (24) David Ragan, Toyota, 160, $107539. (21) Aric Almirola, Ford, 160, $116956. (13) Martin Truex Jr., Chevrolet, 160, $106015. (3) Joey Logano, Ford, 160, $128853. (1) Kyle Busch, Toyota, 159, $140811. (11) Denny Hamlin, Toyota, 159, $93645. (14) Ryan Newman, Chevrolet, 159, $110670. (31) Justin Allgaier, Chevrolet, 159, $102528. (28) Alex Bowman, Chevrolet, 159, $92203. (39) Michael Annett, Chevrolet, 159, $77895. (33) Cole Whitt, Ford, 159, $88853. (26) Casey Mears, Chevrolet, 159, $92092. (36) Matt DiBenedetto #, Toyota, 159, $75895. (35) JJ Yeley(i), Toyota, 159, $75745. (32) Brett Moffitt #, Ford, 158, $74095. (40) Travis Kvapil(i), Ford, 158, $73920. (37) David Gilliland, Ford, 158, $81720. (41) Reed Sorenson, Chevrolet, 157, $73520. (38) Jeb Burton #, Toyota, 157, $73370. (43) Timmy Hill(i), Ford, 156, $73120. (6) Kurt Busch, Chevrolet, 150, $90931. (42) Alex Kennedy #, Chevrolet, 126, $68102. (30) Sam Hornish Jr., Ford, 123, $90375. (23) Trevor Bayne, Ford, Overheating, 91, $104605. (34) Ricky Stenhouse Jr., Ford, Accident, 27, $64030. (2) Kevin Harvick, Chevrolet, Engine, 20, $104855. (16) Kasey Kahne, Chevrolet, Accident, 3, $66530. Average Speed of Race Winner: 132.159 mph. Time of Race: 03 Hrs, 01 Mins, 36 Secs. Margin of Victory: 9.012 Seconds. Lead Changes: 18 among 13 drivers. Lap Leaders: Kyle Busch 1-16; K. Harvick 17-19; Kurt Busch 20-32; M. Truex Jr. 33-38; J. Logano 39-51; Kyle Busch 52; D. Hamlin 53-54; B. Keselowski 55-57; D. Patrick 58-62; J. Logano 63-87; M. Kenseth 88; K. Larson 89-93; J. Logano 94-123; D. Ragan 124; G. Biffle 125-126; J. Gordon 127-128; J. Logano 129-157; Kyle Busch 158-159; M. Kenseth 160;. Leaders Summary (Driver, Times Lead, Laps Led): J. Logano 4 times for 97 laps; Kyle Busch 3 times for 19 laps; Kurt Busch 1 time for 13 laps; M. Truex Jr. 1 time for 6 laps; K. Larson 1 time for 5 laps; D. Patrick 1 time for 5 laps; B. Keselowski 1 time for 3 laps; K. Harvick 1 time for 3 laps; M. Kenseth 2 times for 2 laps; D. Hamlin 1 time for 2 laps; G. Biffle 1 time for 2 laps; J. Gordon 1 time for 2 laps; D. Ragan 1 time for 1 lap. Top 16 in Points: K. Harvick – 780; J. Logano – 734; D. Earnhardt Jr. – 717; J. Johnson – 713; M. Truex Jr. – 694; B. Keselowski – 681; M. Kenseth – 662; J. Mcmurray – 631; Kurt Busch – 620; J. Gordon – 617; D. Hamlin – 614; P. Menard – 591; R. Newman – 584; C. Bowyer – 574; K. Kahne – 559; C. Edwards – 553.